Been out of the hobby/profession since 2003ish. I use to build Shaefer Mounts for Astro-Track Engineering, and was friends with Bill himself way back in the day. After that I managed Astronomy Quest telescope shop in Irvine, CA for a year, then they shut down and my astronomy days were over. So now with all the digital imaging advances out there I've gotten the itch to get back into astrophotography .. but I need to get this thing converted so it can use an auto guider. I have no access to the shop anymore .. nor do I have the electronic knowledge (I was good hand turning the lathes and mill, but always have sucked when it comes to electronics) I also have been out of contact with anybody in the mount/job shop buisness, or anybody for that matter astronomy related. So I'm still in Orange County Calif., and am hoping somebody who sees this post might be able to direct me to the right people to get this thing working with an auto guider. Edited by cloudswimmer, 09 November 2018 - 02:10 AM. If those are AC synchronous motors, might be a good idea to replace them with stepper motors. You can use OnStep or similar software to get GoTo and auto-guiding. Hi, yeah those are old A Synchronous motors (which still work perfectly believe it or not lol) So I pretty much figured yeah stepper motors .. but what I need is someone who I can just take the mount head too .. and have them do the work. Google searching hasn't got me far yet, so I'll go check out your link now. Thanks! Doesn't Losmandy sell conversion kits to upgrade their older mounts? Perhaps you could utilize their stepper motors and Gemini system. (?) At one time I was going to try converting an old Byers mount in this way but the guy selling the mount backed out. A lot depends on whether you want to get rid of the tangent drive on the DEC axis. They are actually better for guiding than worm drives because they have no backlash but you can't do go-to then. So you would need another Byers Starmaster drive as an example to put on the DEC axis with the proper shaft size clutch on it. Once you have drives on both axis you could do OnStep or something similar. On the otherhand if you leave the tangent -arm drive in you need the electronics to power steppers. Actually you may not need them on both axis. My old custom DS-16 has the big 11-5/16" Byers Starmaster on the RA (and a big stepper) and the Meade tangent-arm using the original little Meade DC motor all integrated into a Byers controller. So I could plumb an autoguider port into the Byers handpaddle if I wished. Edited by photoracer18, 09 November 2018 - 05:00 PM. Hi John, yeah I don't really need the whole goto thing. I just looked at Scott's conversion kit and he's designed those motor housings for his mounts .. would take a lot of redesign and fabbing to get those to fit on my Schaefer. I know Tony Hallas and Daphne Mount were using a Mark Park built Schaefer 12" mount at the turn of the century and incorporated the old ST-4 auto guider back then, so I may try and contact Tony and see what he did. Then I'm thinking well maybe I should just sell the thing, buy a more modern lighter weight mount, and throw an Apo on it and go from there .. but there is so much hard labor and sweat that went into this Schaefer, not to mention its history .. that doing so would be very hard. Then I'm thinking well maybe I should just take a crack at digital astrophotography with the way it is and just manual guide it .. my how time erases tedious memories Thanks for mentioning Scott's conversion kits! The ST4 guide port is just four switches. If you can hook in a hand paddle that has switches for N, S, E, and W to your mount (with the tangent arm and synchronous motors and all) and have it manually guide then you can auto-guide. So if you have that, you just need to tap into where the switches come into your existing electronics and then the autoguider ST4 port will act like it is pushing the switches for you (the guider switches would act in parallel with any existing hand paddle switches. Frankly I still manually guide even with the autoguider because sometimes I don't trust it - it is sure a lot easier to manually guide looking at a computer screen than peering into an eyepiece! So I think if your drive corrector still works and has guide speeds then it will work. Wiring to an autoguider is a pain because of the dinky little modular connector, however you can buy a modular adapter to DB9 adapter box which brings out the pins to something manageable to solder to. For me it would be too much hassle to get rid of the tangent arm. You have a really nice looking scope there. You might also talk to them at Sidereal Technology they sell some nice kits for what you want to do. Their site was at first a little confusing to me so I called and talked to them. They were very helpful in guiding me through their products and options. So about 10min into the exposure my two companions come over to my spot with cold beers in their hands while their ST-4's are supposedly guiding their scopes .. and start egging me on and teasing me with bad jokes about my manual guiding while my eye is glued to my illuminated reticle sticking out of my Lumicon 2" easy guider with an Olympus OM-1 stuck on it .. drive corrector paddle in hand. At about the 15min mark while they are still standing there smirking we all hear a beep beep beep beep beep coming from their spot .. and one of the guys blurts out "OH SH*%!" and runs over to his rig, and literally less than a minute later me and the other guy here another beep beep beep beep beep .. but this time its his rig beeping lol. Anyway this happened several times during the course of the night forcing both guys to have to restart their exposures multiple times as of course that beeping meant their autoguiders had lost track. By about midnight I was through with a couple succesful exposures, had put everything away, and went back in the house to go to sleep while they were still out there mucking about lol. I don't know if they ever even captured anything that night as I never talked to them again as I decided to move back down here to So.Cal. literally a couple days latter. So thats my only experience with the SBIG ST-4 or auto guiding of any kind .. seeing those guys fail at it When I got back to So.Cal. I went back to work making Schaefer mounts and refurbished my own during that time. Little did I know that N. Cal. photo session with the ST-4 guys would be my last ever. When I got back down here It was actually Tony Hallas who talked me out of astrophotography after our 45min conversation regarding taking the next step in astro imaging .. which at the time was going to a gas filled Pentax medium format camera and my own hypering rig .. it just seemed too much of a hassle and expense, and I wasn't happy with the grain in 35mm anymore, then Astro-Track Engineering filed chapter 11, I lost my job, and interest in astronomy all together. So now I'm 57, retired, and have a lot of time. I have a built up Jeep Cherokee XJ which my rig easily fits in for transporting to the dark skies of the upper Mojave Desert about 2 hours away. I have one of those Kendick Observatory tents that has only ever been setup once ready to be deployed into action again, and a wife who is interested in going along and helping out (she likes looking at the night sky and enjoys looking at my old film astrophotos) When I showed her whats being done today with digital imaging she said "lets go for it!" My first wife back in the old days just made fun of us lol. So I think all I need is autoguiding capability since my neck is not young anymore. I have a Sony a7rII full frame dslr that I pre-ordered right before they came out .. which is still new in the box unused .. and the firmware was never upgraded. I've read about the star eating of these cameras, but ran across this photo of M31 done by a guy with my exact camera, a Takahashi 106f, and a Sky-Watcher eq6r mount. I would be thrilled if I could get a similar quality M31 .. so I'm thinking of just trying this camera to see what I can come up with before seliing it at a big loss and buying something else. So on the ST-4, was it just those guys lack of competance that was causing all those errors? If I could find one on the used market, and somebody who could wire it into my drive corrector paddle (which does have all four axis buttons), would it be a reliable tool once I got the hang of it? Would I need to get a seperate guide scope for it .. or could I use my old Lumicon off axis guider? My other idea was just get a Sky-Watcher EQ6r Pro Mount and a little Apo refractor like a Tak, or even the cheaper eSpirit .. but I already have this ultra stable smooth as silk mount with an Ed Buyers worm gear, the best drive corrector and paddle you could get at the end of the 90's, a true 1/20 wave mirror, and broken down into pieces is not that bad to move around. So what would you recommend my next step be in this new quest? Edited by cloudswimmer, 10 November 2018 - 01:50 PM. If you are interested in converting the drive to a sevo GOTO try contacting Dave Radosevich. He has done many Schaefer mount conversions using SiTech servo systems. 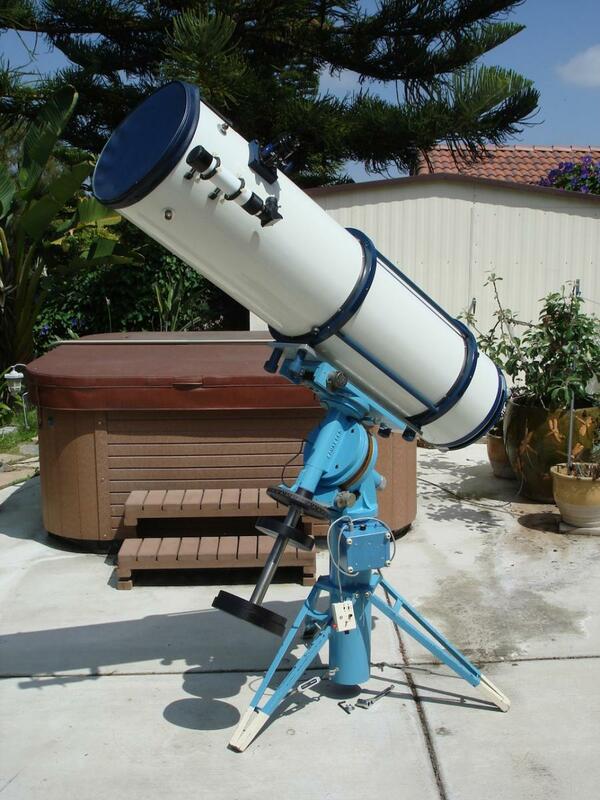 He is on CN and has recently posted about a 36" Dob he is selling so it shouldn't be too hard to find him. I would take that approach before selling the mount.. You won't find anything that nearly as sturdy as your Schaefer mount in a commercial mount unless you are willing to part with quite a large number of dollars. Photoracer18 is correct that the tangent arm is more precise for guiding than most Dec worm drives because it can be nearly backlash free if made correctly. That being said, GOTO gives an enormous increase in efficiency for imaging. 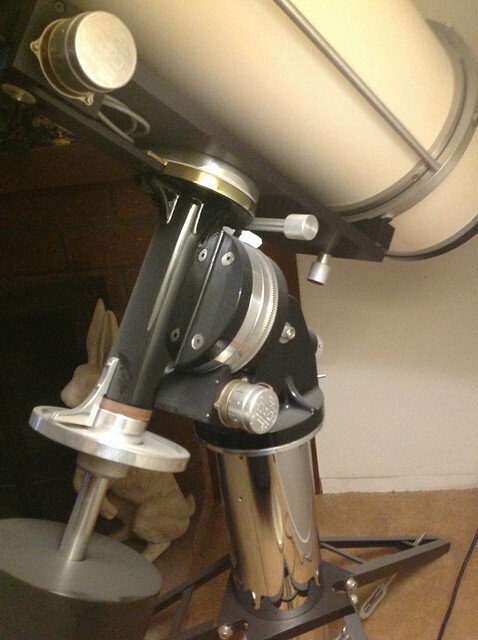 I imaged for many years with a manual 12" Schaefer mount. Dave would be the “goto” guy, no pun intended. I, too, used a 10” Byers gear Schaefer to image in the old hypered film days, and new Bill personally. Dave painted mine with Emron as well, and machined saddles etc. for many. He’s a talented guy. Edited by epdreher, 10 November 2018 - 11:59 PM. I, to, used a 10” Byers gear Schaefer to image in the old hypered film days, and new Bill personally. I'm guessing that Chuck is the "E" that used to belong to OCA. Edited by epdreher, 11 November 2018 - 12:00 AM. I had an ST4 in the hype red film days and they were touchy. Best results were with a separate guidescope as the off axis image with an OAG on a Schmidt Cass or fast Newtonian were a bit too bloated. I also ended up finding some of the issues were power. I had a weak battery that dropped Voltage whenever the mount needed a Dec pulse that would cause the ST4 to reboot. Separate battery fixed that. But my best shots I felt were ones I guided manually. I got burned out at a similar point looking to go down the Pentax 6x7 route and no labs in town that could develop it, plus the cost. Plus when I got through the learning curve I had only binoculars to kill the time and ended up buying an old C11 with for to do visual while the ST4 ran the AP 130 EDT on the 900 QMD Mount. Realized I enjoyed the visual more. I still have the ST4 and the 80mm guidescope from Astro Physics. A long shot, but JMI had a drive corrector, the Mototrack V that was already pre wired for the ST4. Since you aren’t looking for go-to, the tangent arm dec is fine. I would try posting ads looking for one of those JMI units. So to be clear, your drive corrector still works with your hand paddle? If so you just need to wire an adapter so that the camera guider ST4 type outputs are in parallel with your hand paddle switches. There are guide cameras that are the same size as a 1.25 eyepiece so you can just put it in your existing guider. This is like a ten dollar project except for the guide camera. And you can manually guide with an autoguider. Last night l sat on my sofa and manually guided my 16" telescope by remoting into my scope computer and watching the star on the screen and giving it a nudge every so often. I dropped by Morgan's shop with Bill a couple of times. Also knew Mark Park when he was making the mounts. Used to hang out at Bill's place with the guys for lunch every Saturday. Bill taught me the basics of machine work. Edited by Chucke, 11 November 2018 - 12:45 PM. @epdreher .. Cool! Yeah boy a 12" Newt on a big Schaefer was huge back then ehh Looks exactally my mount .. but with more modern motors Thanks for sharing that pic! @555aaa .. Yes the hand paddle and drive corrector are still like brandnew, only used them a couple times .. both have just been sitting in an air tight Pelican case ever since. I was hoping to find an ST-4 rig on the used market but have come up empty handed so far, so what would be a modern equivelant I could use and wire in? @Chucke .. Ahh ok I remember you now Chuck .. big guy big scope .. RTM in Big Bear .. I went up there with Morgan when he was doing AT and remember us all chatting a bit. Use to go over to Bill's apartment and little shop in his garage port with Morgan starting when I was about 12 years old in the 70's. By the time I was working with Morgan at his shop up in Cowan Heights Bill had recently already passed away, and I don't remember you dropping by after that .. but do remember you again from RTM. Do you still have that big Newtonian? What is the RPM of your synchronous drive motors? I recently upgraded a 1970’s Cave Mount by swaping the RA to a 6” Byers drive with Losmandy digital drive and stepper motors on both axis. If the RA gear of the Shafer mount has 359 teeth the Losmandy G11 Digital drive & motors will work perfectly without any changes to the electronics. You know I have no clue, I'd have to go manually count, but I just got off the phone with Tony Hallas, and he said when he was running his 12" Schaefer mount he just wired an ST-4 into his hand paddle as others suggested here, and suggested I could get a more modern CCD autoguider and do the same thing, but more importantly he said for what I want to do I could get by with a much smaller cheaper mount and a little refractor, so what I'm thinking is I may just get a Sky-Watcher EQ6r mount and Takahashi 106, then just take along my Schaefer and Newtonian as they are for observing while the little rig is doing its thing. Thats cool you have an old Cave mount .. as a kid in the 70's I use to drool over my Cave Astrola catalog Do you have a Cave tube assembly too? Alika Herring use to do mirrors for Cave back in the day .. truly great optics! Yes, I still have that scope although I've upgraded it considerably since then. Now I'm using the 22" in my avatar and the old 16" sits in my garage collecting dust.. Currently building a new mirror cell for the 22". The mount uses a SiTech servo system. I pulse-guide with it so no ST4 cable and relay box anymore. Back in the day when using the ST4 I put a DB9 connecter in my hand paddle and paralleled all of the switches. I could autoguide and still use the buttons. When I got my ST10 I used the SBIG relay box between the camera and the hand paddle with no other changes since it has a DB9 to the drive corrector on one side and RJ11 to the camera on the other. I used it for many years until I went GOTO. The 12" Schaefer mount has 359 teeth unless the original buyer specially requested something different. It uses the 11 5/8" Byers gear. They usually used a 1 RPM motor with appropriate reduction gears. On the smaller mounts I'm not sure how many teeth. Edited by Chucke, 11 November 2018 - 06:57 PM. 22" wow! So I assume you have a permanent for that? Or are you still transporting your rig? I get pooped just moving my little 10" around. Remember those removable mirror cells Bill use to make .. I could use one of those even tho my scope is relatively dinky compared to yours .. don't suppose you could make one for me On the gear .. Morgan swore up and down mine is a Buyers .. but I don't think it is .. I think its a Mathis .. do you know the history of when Bill started using Ed's gears? Either way mines always been very accurate .. just would be fun to know what I 'really' have .. and since you were a part of the scene there in Fullerton back in the day I'd figure you'd know as well as any. Are you still in So.Cal? Edited by cloudswimmer, 11 November 2018 - 07:21 PM. In my last year of High School there was a night class on Telescope mirror making. I ground and figured a 8" F8 at that class. Just in case someone may know him the instructors name was Clifford Niman. Once my mirror was done I took a trip to the Cave Optical Co. store in Long Beach and purchased a Mount with clock drive and most of the other parts needed for the scope including the rotating rings. Just in case you may be interested in upgrading to stepper motors, the RPM of the 120v Synchronous motors is stamped on the motor casing, usually on the back of the motor opposite the output shaft. So how did your mirror turn out .. good .. excellent? Obviously not bad or you wouldn't have invested in the rest I too took a mirror making class .. with John Dobson of all people .. but I ended up dropping out of it as the drive was just too far every week from Healdsburg to San Francisco .. plus I had really started to get the hang of long exposure astrophotography and enjoyed that more than the tedious work of moving that slab of pyrex back and forth whilst circling around the 55 gallon steel drum over .. and over .. and over lol. You were a much more patient man than I That must have been pretty exciting once you got it all together! I'm not in CA anymore. Retired and moved to the boonies in AZ not far from ASV. I now have a ROR observatory so everything is permanently mounted. For a while I used to set up the 22" at Anza but it was a two man job and I wasn't always sure there would be help, particularly for teardown. The big problem was managing the mirror cell. The mirror in its cell weighs close to 100lbs. That's a bit much for a one man operation. 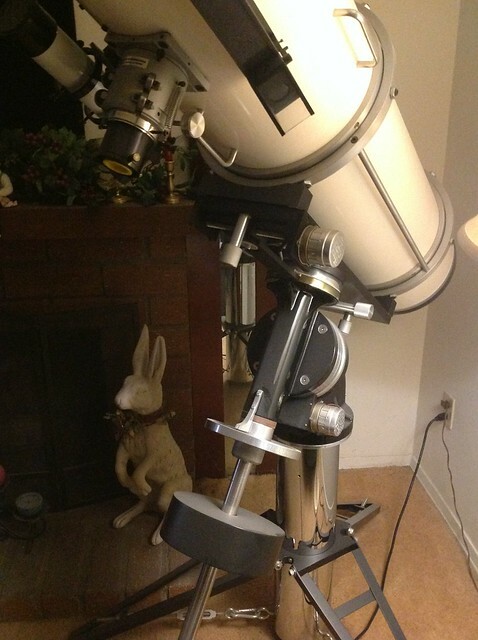 Eventually I packed it up and went back to the 16" until I had the observatory. I could set up the 16" by myself. Also, the 22" as originally constructed had some issues that I am just now finally getting worked out. They didn't make it unusable but they made it less than optimum. I don't think Bill ever used Mathis gears on a regular basis. Only when someone supplied one. He and Byers were longtime buddies so he almost always used Byers gears. I think he got a good deal on them. You may be able to tell by the appearance. The Byers gears were either un-anodized or were completely gold anodized. The Mathis gears tended to be anodized on the faces but not on the teeth. Don't know what Mathis does now days. Arizona .. thats awesome Chuck! I use to live on the border of Apache Junction and Mesa for a while in the 70's, as a kid boy was it a different lifestyle from the Newport Beach surfing scene I was accustomed to .. I loved it! lol. Orange County has just turned foreign to me, and I hope to be joining you out there once the folks have passed on. Anyhoo .. yeah the gear on mine is totally un-anodized, so I guess that would be early Buyers then? Like I said Morgan swore up and down it was Buyers .. and he was closer to Bill than I ever was. I don't remember who suggested it might be a Mathis, but I think you've finally cleared this up for me .. so thanks!